Due to my boxing web site Cox's Corner and You Tube videos I am often asked a lot of questions by boxing fans. One of the questions I am asked is "Who is the most under rated heavyweight champion of all time?" There are a number of good candidates, but the one heavyweight that is greatly under rated by my peers and is not justly appreciated for what he brought to the ring is one George Foreman. He won an Olympic Gold Medal after boxing only 1.5 years and with only 20 amateur fights going into the Olympics. That is just unbelievable, in some ways his most notable achievement. He destroyed an undefeated heavyweight champion who was considered the best heavyweight in the world at the time, crushed him in only 2 rounds and ruined his reputation to this day, Joe Frazier who was a true all time great. Smokin' Joe is an equal to Marciano, but does not get the credit he deserves because of his loss to Foreman. Big George came back and won the lineal heavyweight title 20 years after losing it. That is just mind boggling. No one and I mean no one else could do that, not Jack Johnson, not Jack Dempsey, not Joe Louis, not Rocky Marciano, and not Muhammad Ali. Nobody. Imagine the 1988 Super Bowl champion Washington Redskins lead by Jay Schroeder, George Rogers, Darrell Green, Mark May, Joe Jacoby and company coming out of retirement to win the Super Bowl in 2008. Or imagine former Wimbledon tennis champion Stefan Edberg coming back and winning that tournament. Doesn’t seem possible? Couldn’t happen in a million years? But that is precisely what happened when an old George Foreman came back against the odds and won the world heavyweight championship, the greatest prize in sports, when he regained the title in 1994 some 20 years after having lost it. On longevity alone George Foreman deserves to be considered among the all time great heavyweights, but he is often over-looked because he was over-shadowed by and lost to Muhammad Ali. However, this is no disgrace as Ali is often regarded as the greatest heavyweight champion ever by modern observers. George Foreman at his awesome best was the most powerful heavyweight champion ever. At 6’3 ½” and 220-225 pounds, with an 82” reach he was the best of the “super-heavyweights.” Consider that George Foreman, in his prime had the highest knockout percentage in boxing history. After his destruction of Norton, he was 40-0 with 37 knockouts, for a knockout percentage of 92.50. In his career Foreman had 15 first round knockouts and 18 second round knockouts. That's 33 knockouts inside of the first 2 rounds! He had 46 knockouts that were 3 rounds or less, which is more than any other heavyweight champion. George Foreman’s incredible two round destruction over Joe Frazier was the most one-sided beating ever delivered upon an undefeated heavyweight champion. Foreman was a man of great physical strength and can be favorably compared to the legendary strongmen of the past. It was said that John L. Sullivan once single handedly lifted a derailed trolley car back onto the tracks. Jim Jeffries once ran 9 miles to camp carrying a deer on his shoulders ahead of his entourage. Likewise George Foreman once trained using a harness so he could pull a car uphill as he did his roadwork. Strength, size and power are the adjectives used to describe a true super heavyweight. George Foreman was as big and as bad as they come. After destroying # 1 contender Ken Norton the Aug. 1974 International Boxing magazine wrote, “The pre-fight strategy, the planning, the training, the waiting…they were all ended in less than two rounds by the punishing fists of possibly the most powerful heavyweight champion ever.” Indeed such was the devastation that Foreman’s sledgehammer fists had laid on opponents that all time greats such as Jack Dempsey and Joe Louis both commented that Foreman was the strongest heavyweight hitter that they had ever seen. At his peak Foreman had a true aura of invincibility. When he glared down opponents with his baleful stare it was not an act of false bravado as it was with some fighters, it was out of a belief that no man could stand up to his crushing power. George Foreman, in his prime, truly believed that he was unbeatable. In his title winning performance against Joe Frazier Foreman used a hard left jab, shoved Joe’s shoulders back to create punching room against the swarming fighter and scored knockdowns with short right hands, uppercuts, hooks, and a long overhand right. 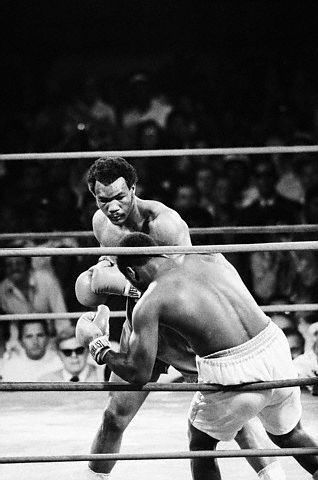 Foreman was nothing short of devastating as he bounced Frazier like a basketball off the canvas six times. George was a very heavy hitter, and he threw more correct punches than he is given credit for and he often put the full weight of his super-heavyweight sized body into his punches. One can see this in his films when George turns his hips into his punches as in his rematch against Frazier. As a fighter George brought to the ring not only exceptional raw power and confidence but also a frightening arsenal of deadly punches. His uppercuts could lift a man off their feet, his hooks were paralyzing, his strong left jab was true, his right hand, although not often thrown straight was a decapitating blow thrown short or long. He used his massive arms to block punches and could parry punches with his rear hand. He would sometimes slap opponent’s guards down with his hands and then slam home massive power shots to the head and body. The Foreman of 73-74 also became very good at cutting down the ring on his opponents. The only reason Ali won that fight in Zaire was because Muhammad had a cast iron chin and could absorb tremendous punishment to the body. Only Ali’s incredible ability to take a beating and his enormous will allowed him to survive George’s punches that night. If Ali takes a punch a little less than what he did he would have been finished by his own admission. Ali said in his autobiography that Foreman had him out on his feet but didn’t know it. How many people could take a body shot the way Ali could? He survived Zaire and Manila as well. Foreman landed some hellacious body shots on Ali. They were exceedingly violent. In Muhammad Ali His Life and Times by Thomas Hauser Foreman is quoted as saying, “I hit Muhammad with the hardest shot to the body that I ever delivered on any opponent. Anybody else in the world would have crumbled. Muhammad cringed; I could see it hurt. And then he looked at me; he had that look in his eyes, like he was saying I’m not going to let you hurt me.” Archie Moore also recalled, “George threw some rather lethal punches in the direction of Ali’s cranium.” Ali did not beat George by boxing him that night in Africa. Ali was unable to keep the fight in the center of the ring, he was forced to fight off the ropes, and he was forced into a fight for survival. 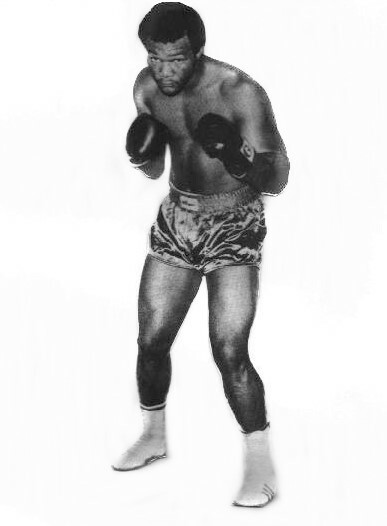 Ali beat George primarily with physical and mental toughness, but was also aided by his uncanny ability to anticipate and ride with punches and his unique ability to lean away from punches. That is what it took "The Greatest" to beat a prime George; one of the best chins in heavyweight history, uncanny athleticism, physical and mental toughness and a tremendous will to be able to stay in there and dodge and survive Foreman's punches. Not too many fighters who ever lived, and possibly only Muhammad Ali, could defeat the George Foreman of that fight. Ali's great boxing skills; his ability to move, his footwork, his exceptional head movement and anticipation did not allow Ali to "out" box George from ring center. George cut the ring on Ali very well in Zaire. Ali outsmarted him yes, but mostly Ali toughed it out where most heavyweights would have wilted. Few men besides Ali could take the shots that he did. Few who slugged it out with a prime Foreman would have hopes to survive. After losing to Ali, George, who had thought himself unbeatable, began to doubt himself and changed his style. George was devastated by his loss to Ali, after taking time off he changed trainers hiring Gil Clancy and began to fight at a more measured pace. Although George had some success even at an old age fighting in a more controlled manner, the comeback version was never as good as the original seek and destroy version. In his first comeback fight George Foreman took the most dangerous opponent he could find. After 15 months of ring inactivity he took on Ron Lyle who just 10 months previous had knocked out highly regarded heavyweight hitter Earnie Shavers. Lyle had come off the deck to defeat Shavers in a match between two of the divisions all time biggest hitters. Lyle was himself a super-heavyweight who stood 6’3 ½” had an 80 inch reach and weighed 220 pounds of solid muscle. He could jab, hook off the jab and had a very powerful right hand. Foreman was now trying to pace himself and began to fight at a more relaxed tempo. The result was that George was not quite as aggressive as he had been in his earlier fights. The first two rounds were tentative as George attempted to hold back and there was frequent jabbing by both men. Foreman proved his heart and chin in this fight when it exploded into a wild brawl reminiscent of Jack Dempsey and Luis Firpo some 50 years previous with both men hitting the deck. Foreman demonstrated that he could win a war of attrition and come out on top by knocking Lyle out in a see saw battle that ended in a knockout victory for Foreman in the fifth round. Even a rusty and hesitant Foreman was nearly impossible to beat in a brawl. I get a good laugh when boxing people think that all you have to do to beat George Foreman is "box" him. Is that it? Is that all you have to do? Go ask Ali about that one. Those who do hold on to this error and believe that any “clever boxer” type could beat George often give the Jimmy Young fight as an example. Foreman showed up for this fight in San Juan the day before the fight and didn’t give himself time to get acclimated to the heat. He paced himself, fighting in his newfound measured style and did not throw a significant punch for the first 5 rounds. This was all wrong for him. The Foreman of Zaire would have tracked down Young, forced him to the ropes, went to the body with power and belted him out inside of a few short rounds. The 1973-74 Foreman, the one who cut the ring and really went after his man was the best Foreman. The George who lost to Young never really went after him. The Foreman who fought at a measured pace just was not the real George Foreman. After losing the decision to Jimmy Young the former heavyweight champion became an ordained minister. Ten years later George needed money to support his youth center so he launched a comeback that was scoffed at by critics. George proved them wrong as he worked his way into title contention. His knockout of Gerry Cooney was an awesome display of both tremendous punching power and deadly accuracy. At age 42 he gave an undefeated Evander Holyfield an outstanding fight, stunning him and driving him to the ropes in the third round. 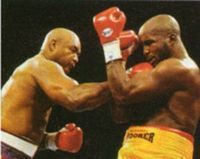 A much older and slower Foreman fighting at a tortoise pace and lacking the meanness and killer instinct of the young George failed to go after Evander and ended up losing a decision. George proved the quality of his chin in this fight taking 25 unanswered punches in round nine from the champion without falter. One could not help but think that the Zaire Foreman would have beaten Holyfield. George shocked the boxing world in 1994 when, at the age of 45, he regained the heavyweight championship by defeating an unbeaten 25 year old champion with a sensational ten round come from behind knockout of Michael Moorer. The victory must be considered one of the greatest comeback stories in the history of sports. Twenty years after having lost to Muhammad Ali, Foreman vindicated himself by regaining the linear heavyweight championship. The fight remains a testimony to the extraordinary power that surged through the veins of George Foreman. When comparing fighters from different eras one must ask under what rules are they fighting? Imagine George fighting in Jack Johnson or Jack Dempsey's era with 5 ounce horsehair gloves and being able to stand over a fallen opponent as they did. Scary! Under those conditions George may never have lost a fight. Foreman was a physical freak of nature in terms of his sheer power and just because one could box cleverly doesn’t mean one would survive. In order to beat the prime George one is going to have to take some very, very hard punches along the way. George had the size, reach, power, chin and killer instinct to be a threat to any heavyweight who ever lived. The post Ali versions of Foreman who fought at a controlled pace would have all lost to Larry Holmes, but the Zaire version would have beaten him. Larry would not have been able to “rope-a-dope” Foreman the way Ali did. Although Holmes had an outstanding chin he did not absorb punishment at quite the same level as Ali. He did not have the ability to lean away from punches the way Ali did, nor would there be those loose ropes to aid him in pulling back and away from George’s punches. Foreman at his peak beats Larry Holmes. Cus D’Amato once said “no swarming heavyweight who ever lived would defeat George Foreman.” George beats any of the great swarmers including Jack Dempsey, Rocky Marciano, and Mike Tyson (see Frazier fights). Don't tell me that Dempsey, who I have nothing but admiration and respect for, would be able to box and stay away from George until he wanted to move in. If Ali could not box and move against George how would Dempsey do it? Or Gene Tunney? Both who were smaller men. Tunney in particular just would not have the strength to keep a prime George off him. One must realize some guys are just too strong to box. Frazier was like that, you have to have the punch to keep him off and have the toughness to hang in there. Against George it would take a supreme world-class chin and the ability to absorb bone crunching body shots as well as clever defense to survive. Of the swarmers Dempsey is the only one I would give a chance against George but coming to George is a difficult endeavor because of his awesome uppercuts and heavy artillery. With 5 ounce gloves George would knock Dempsey out of the ring a la Firpo and Jack would never beat the count. Lennox Lewis and Wladimir Klitschko, who were both knocked out in early rounds by lesser fighters, would fall in two rounds to Big George. Few fighters of history could make the requirement against the most powerful of the big men. George Foreman at his awesome best is the king of the super-heavyweights. Cox's Corner rates George Foreman among the five greatest heavyweights of all time.